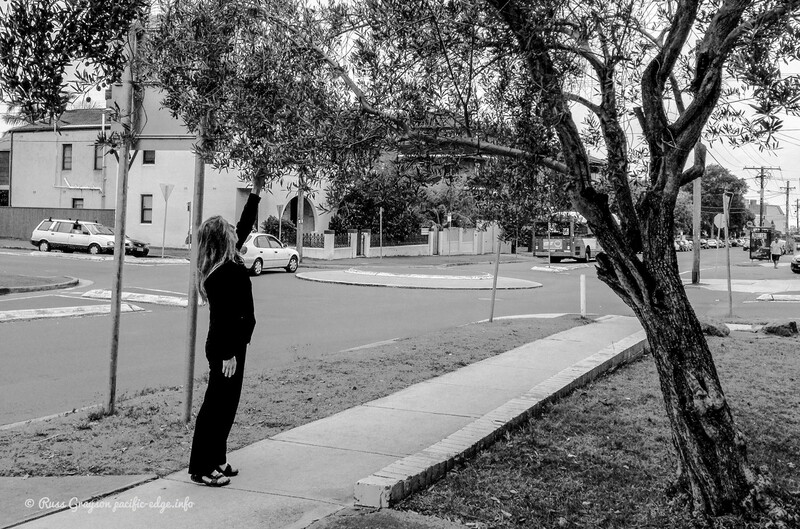 A woman checks out ripening olives on a tree growing on private property and overhanging the footpath. Does she have a legal right to harvest the olives? This is not legal advice and reference to legality is based solely on the author’s understanding the law. Legal aspects refer to Australian law. Laws may differ between Australian states. The article is of primary interest to foragers. This is not legal advice. It is offered as information only and not as advice in any form. Foragers are advised to learn about laws in their own states. harvest edible crops growing on public land. the term ‘private land’ refers to land the property of an individual or organisation. 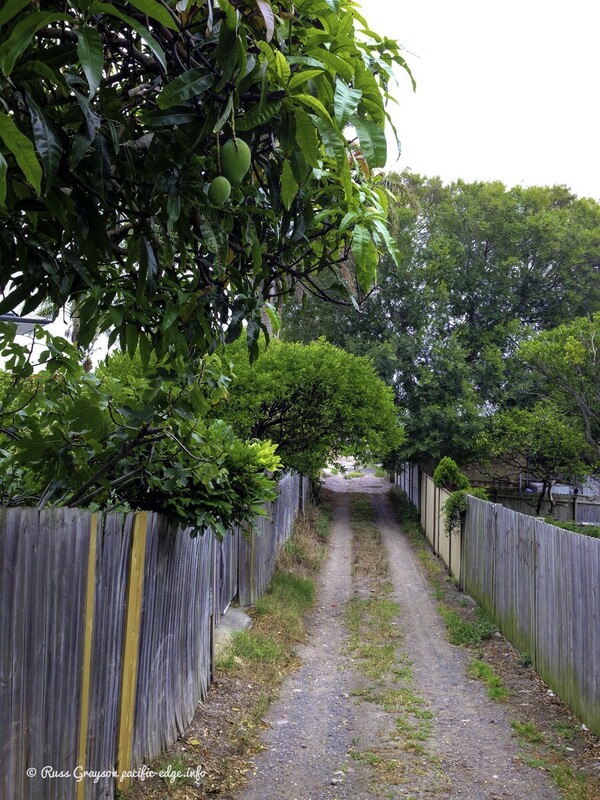 Mangoes and, further along, citrus overhangs a public lane from private backyards. Under state laws, foragers can harvest the overhanging fruit. The question of the legality of harvesting accessible fruit and nuts on branches overhanging public land from private land, and of harvesting edible species or taking other parts of plants growing on public land arose with the increased interest in urban gleaning in recent years. There is confusion around the legality of harvesting fruit and nuts or taking other materials from the branches of trees and shrubs growing in private urban gardens whose branches overhang public land. Harvesting overhanging fruit and nuts is a common practice. Maintaining good relations with owners of overhanging trees is always worthwhile. Foragers often ask the owners of overhanging trees if they mind their taking overhanging fruit. Sometimes, they see a fruiting but neglected tree or shrub in a private garden and approach the owner about harvesting it. Returning to the owner of the plant a jar of jam or other produce the foragers make from the harvest maintains good relations and the possibility or harvesting again next season. Some edible crops growing in public open space such as local government land are maintained by volunteers. There is an expectation among volunteers that non-volunteers will harvest a little of the produce from time to time but leave the bulk of the produce for those who maintain the gardens. There might also be an arrangement for a charity to harvest to support its program. Consistently losing fruit and vegetables to opportunistic, non-contributing foragers discourages volunteers. Foragers might instead join the volunteers who maintain the plants to get a share. It is the same in community gardens. Even though community gardens are often on public land, they are set aside for the use of members of the gardens. There is an expectation that non-members will not forage in community gardens. Citizens planting on footpaths should not expect the fruits, vegetables or flowers not to be taken. Many who garden their footpaths see their work as a public resource and are happy for people to take a portion of what is produced. The legality of foraging from fruit or nut-bearing tree or shrub branches overhanging public land from private land is a Common Law matter. Laws and regulations are administered by state and local government and may differ in each state. Harvesting is legal in most Australian states. Local government may prohibit the removal of any kind of vegetation growing on public land. This would include edible parts of trees and shrubs. This would be a problem for foragers a well as for bushfood enthusiasts who harvest edible Australian native species. It would potentially complicate harvesting bushfoods in patches of remnant urban bushland. As well as legal questions around the practice there are also moral questions such as those concerning taking from gardens maintained by volunteers. Foragers are advised to check the state and local government laws and regulations where they intend to forage edible or useful parts of plants. These may differ state to state, council to council. This applies also to foraging edible or useful fruits or plant parts of native plants in bushland. Foraging is not permitted in national parks as, to they are set aside for the preservation of natural systems. Foraging seed or other plant parts in botanic gardens is prohibited. 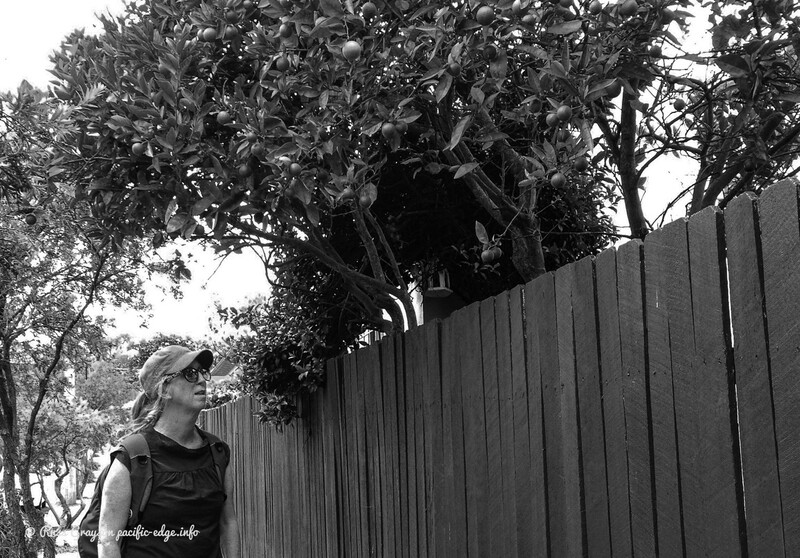 In their online course, Law for Non-Lawyers, Monash University educators state that in Victoria, fruit lying outside the boundary of private property, such as fruit hanging over a fence into a public area, is considered to be public property, so anyone can legally take it. In the article on ABC Radio Brisbane (see below), the journalist said it is legal to forage fruit that is growing on private land and that overhangs public land. Citrus overhangs a street. There is confusion around the legality of taking the fruit. Do not harvest all the fruit or other parts of a plant so as to leave some for others. If the plant overhangs from a neighbour’s property or overhangs the footpath from a property, to maintain good relations it is advisable to ask the property owner whether they mind plant parts such as fruit being foraged. Do not forage in community gardens, including taking seeds or plant cuttings. Doing so takes from those who do the work of maintaining the gardens. Limit or avoid foraging from plants in public places maintained by community volunteers. Doing so is viewed as benefiting from the work of others while the forager makes no contribution to maintaining the plants. When planning to forage, consider others: if they are neighbours, should you ask if they mind you foraging their plants overhanging public land; with edible or useful plants on public land, consider whether you will be taking freely from the hard work of those who maintain the garden and whether that is morally justified. Don’t be greedy. Always leave some for others.